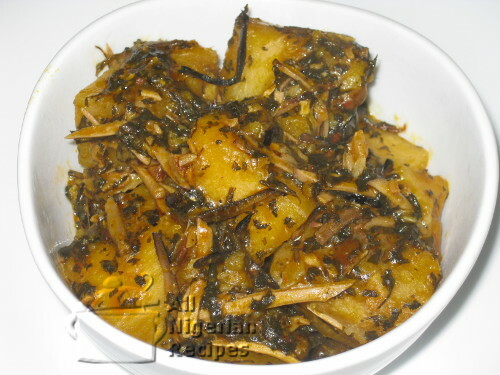 Traditional Igbo recipe alert: Preparing Yam Porridge with bitter leaves is one of the most traditional ways to prepare yam in Igboland. You could swear that it is Bitterleaf Soup being cooked when it is in fact Yam Porridge. This is because most of the ingredients used in this recipe are used in Nigerian Bitterleaf Soup too. Peel and cut the yam tuber into medium cubes. Rinse the yam cubes and place in a sizeable pot. Grind / Blend the pepper. Grind the crayfish. Set these aside. Pick out the bones from the fish crumbs and rinse the fish. You will be using washed and squeezed bitter leaves with no trace of bitterness so make sure this is ready. When rinsing bitter leaves for Bitterleaf Soup, I usually set aside the tiny pieces that settle at the bottom for use in this traditional Yam Porridge. See video below. If you only have the long strands, cut them into pieces before using them in this recipe. Set the pot with the yam cubes on a stove. Add the dry fish crumbs to the yam cubes. Add ukpaka, crayfish, stock cube (crushed), pepper and bitter leaves. Try and distribute these on the yam cubes as you add them. Pour water to just under the level of the yam cubes in the pot and start cooking on high heat. When the contents of the pot boils very well, add the Ogiri Igbo and enough palm oil to give the Yam Porridge a nice appetising colour. Cover the pot and continue cooking till the yam is well done and the surrounding liquid is beginning to thicken. Add salt if necessary and stir very well. Cover and cook for 2 minutes and it's done.